Have been lucky enough to visit this Pub a number of times in the last few months, while visiting friends. London Pride and Doom Bar seem to be on all the time, and are always in tip top condition, and accordingly delicious. As has been previously noted, the carpet is not in the best of shape. Personally I couldn't care less. The only part of me that comes into contact with the carpet, are the soles of my shoes and they are not at all fussy. Unfortunately new carpets, posh furniture etc. will encourage the 'suits' and another lovely pub will be lost to it's locals. Looking forward to my next visit in March. 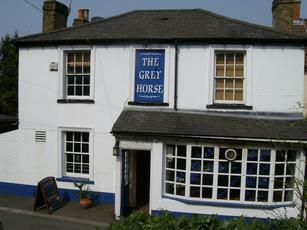 The Grey Horse is a far cry from the other pubs we visited in Lower Sunbury on Saturday. I was here for a function. It's a typical locals' boozer, most likely with a loyal clientele. The small bar is well worn. Carpets could certainly do with replacing. But there is a large outdoor area with a garden at the rear. Pride & Doom Bar were the real ales. Things must have changed since the last review. Went with my partner and was not happy. Staff were rude when they could be bothered to serve anyone they didn't know personally. One of those locals meant for locals. The beer was not good but I was willing to try another until my partner returned from the toilets and said there was no way she would stay there. I visited the blokes loo and saw her point, pretty rough. Wont be adding to my crawl list. This old pub on the original bit of road before the railway serves real homemade food, mains £5.95 which is great value considering the ma size portions. The ales are well kept albeit invariably the London Pride/Doom Bar duo so commonly seen these days. Friendly locals and regs make you welcome without hassling. Would be good if the beer varied occassionally.